Take all religion out of our schools! Free Yoo Ki-soo, South Korean union leader! Solidarity with Lambeth College strikers! In the run up to the World Cup, the Brazilian city of São Paulo was rocked by demonstrations, riots and a subway strike. Striking workers successfully closed over half the subway stations in the city, and are threatening to strike again on the day São Paulo hosts the first match of the tournament. Angry that their wages have stagnated whilst the government spends billions on the World Cup, the strikers are demanding a 12% pay increase. The Hands Off London Transport (HOLT) campaign, a coalition involving the RMT union, Disabled People Against Cuts activists, student unionists, pensioner activists, and others, plans a Day of Action against Tube cuts on Friday 13 June. Activists will organising leafleting, demonstrations, and other actions outside local Tube stations including King’s Cross, Walthamstow Central, Leytonstone, Elephant & Castle, and Brixton, to highlight the damaging impact Boris Johnson and London Underground bosses’ cuts plans will have on passengers as well as Tube staff. The political structures of the European Union exemplifies how badly the bourgeoisie “does democracy” when they are under no pressure from a confident working-class political organisation. European political structures — the elected European Parliament, the European Council made up of heads of government and the Commission with member-state appointees — are all bureaucratic and dominated by obscure political horse-trading by member states. 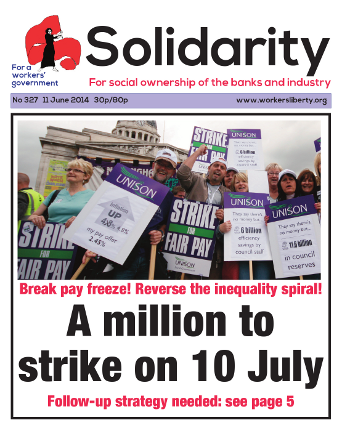 More than one million public sector workers could strike on Thursday 10 July. Workers across local government, education, the civil service, the fire service, and other public sector workplaces and industries are likely to launch coordinated strikes over pay. GCSE English Literature hit the headlines after outrage on social media at the “banning” of certain well-loved texts including John Steinbeck’s Of Mice and Men and Harper Lee’s To Kill a Mockingbird. The DfE were swift to claim that they have not banned any texts and denying Michael Gove has “a particular dislike” of Of Mice and Men. But what has not been denied is that Gove had significant personal influence over the design of the new syllabus (as distinct from the exams themselves, which the exam boards control). A group of three academies, one other academy, and one council-controlled school in Birmingham have been put into “special measures” by Ofsted government inspectors for allegedly acting like “faith schools”. Ofsted complains that Park View school has weekly “Islamic-themed assemblies”, with invited speakers “not vetted”, and that from year 9 onwards religious education is almost all Islamic. Faith schools are explicitly allowed to have their assemblies, and their religious education, organised around their chosen religion, and to imbue other subjects with religious ideology. Cinema workers’ union BECTU has called for a national boycott of Picturehouse Cinemas until they agree a pay deal with workers at The Ritzy in Brixton, South London who are striking to win the London Living Wage. Picturehouse Cinema bosses pulled out of talks with BECTU and unilaterally imposed a 4% pay deal, which still leaves almost all staff paid below the poverty line. Yoo Ki-soo, General Secretary of the Korean Confederation of Trade Unions (KCTU), was arrested on 26 May by the South Korean government, after a protest calling on the government to take responsibility for the Sewol Ferry Disaster. The ferry was carrying 476 people — mostly South Korean schoolchildren. It sank on 16 April off the southern coast of the country. The death toll has reached 288, with 16 people still unaccounted for. No bodies have been found since 21 May. Russia has recognised Ukraine’s newly-elected president Petro Poroshenko by opening talks with him (through the Russian ambassador in Ukraine) on 8 June. The talks have for now dispelled talk of further US or EU sanctions against Russia, and boosted the Russian stock market. According to the Financial Times (9 June), Putin has three chief demands. Ukraine to “give regions veto powers over foreign policy decisions made by Kiev — in part as a guarantee of Russian interests.